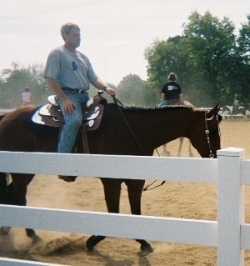 To participate in the IQHA Horseback Riding/Driving Program you must be a member of the Indiana Quarter Horse Association. An active membership must be maintained during the time that you accumulate hours. There is a one time $20.00 enrollment fee. The horse you ride or drive in this program must be registered in the American Quarter Horse Association. You do not have to own the horse. You may accumulate hours in IQHA's program at the same time you are accumulating hours in the AQHA Horseback Riding Program, if you are enrolled in both. The AQHA registered name and registration number of the horse must be on the log sheets. You may ride more than one quarter horse. Separate log sheets must be kept for each horse. All time logged is on a one horse/one rider basis and is on the honor system. An accurate record of the time you actually spend riding or driving must be reported on your official IQHA Horseback Riding Program Log Sheets (copies of AQHA log sheets are accepted). Your hours carry over from year to year as long as you maintain your IQHA membership. Submit log sheets by December 1st each year. Members who log time on a State or National trail (as recognized by the State of Indiana or US National Parks) earn bonus hours. For every hour you spend riding or driving in an Indiana State Park or National Park you receive one bonus hour. (Double hours). You must name the park in your log. You also receive bonus hours for participating in an AQHA approved Trail Ride. The coordinator awards the bonus hours. Annual achievement levels will be listed in the IQHA Directory and on the website. In addition 1000-hour and upward levels will be pictured with a short article. To enroll: Complete the form and return it to the secretary with the appropriate fees. You'll receive your Official Log Sheets. These may be copied as needed. Enrollment in AQHA's Horseback Riding Program is not required, but is encouraged. Start earning State and National recognition for doing what you love, riding your quarter horse!